2013 was a year of both personal and creative challenges. Due to many changes in my life, I was only able to create one quilt in the year 2013. 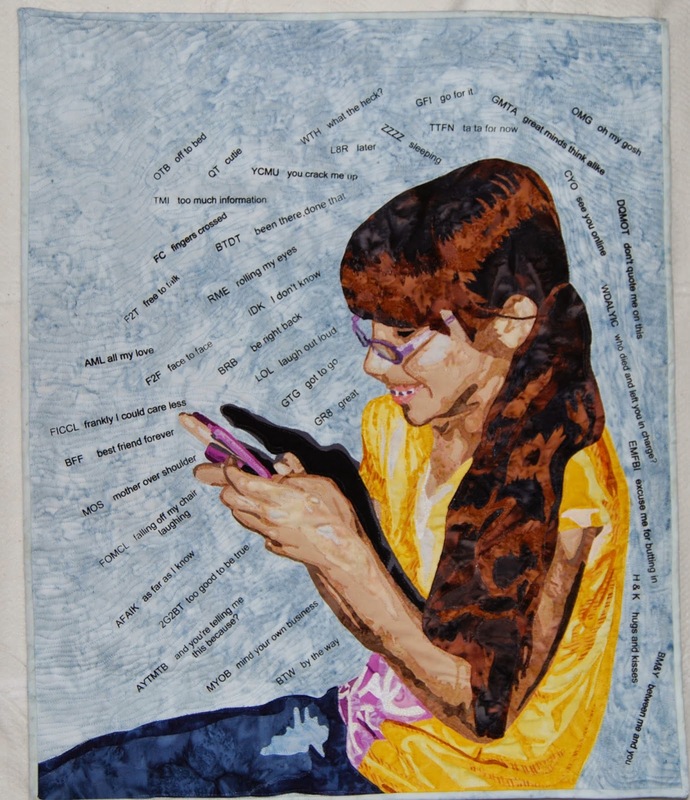 It's a quilt of my youngest daughter which made the cover of the Text Messages catalog, published by Studio Art Quilt Associates. I've learned from every quilt that I have made and continue to grow artistically. 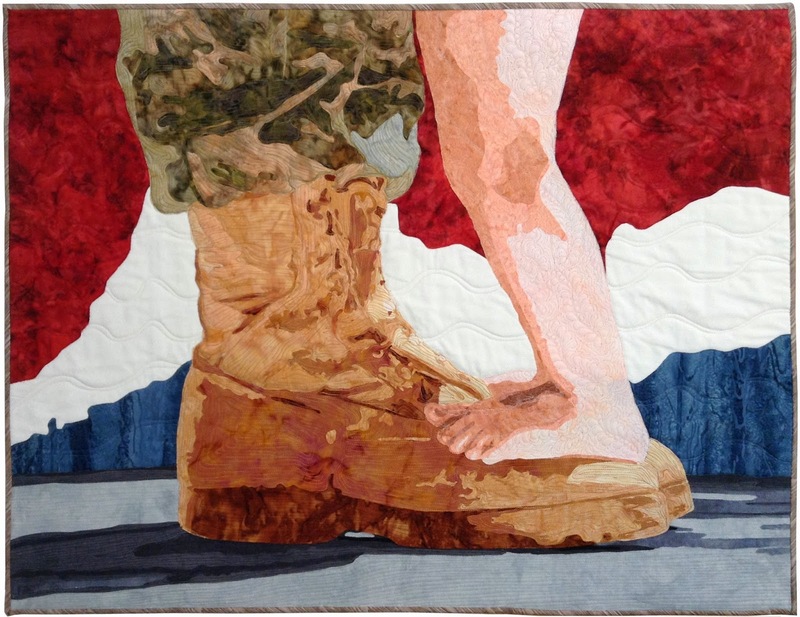 In 2012 I made a quilt depicting a service man and his daughter's reunion only showing their feet. This quilt won the Carol Wilks Award in the Machine Quilters Showcase 2013. Last month I received an email asking if IMQA could do a feature article in their magazine, "On Track," on me and my quilting style based on this quilt. The article is written but I don't know when it will come out but it seems everything has a ripple effect. What you do today affects what happens tomorrow. So I have learned to make my choices wisely. I have finished my third quilt in the series Living the Good Life. It is titled "See you on Kauaii." It is adapted from a picture of a friend of mine. I took some creative license with it. Despite all the bead work, I am quite pleased with it. I am currently working on getting it submitted to shows, hence no pictures as of yet. I have been taking college level art classes for the last 2 years and amazingly enough I have learned lots and improved immensely. Just ask my oldest daughter. I finished a small mixed media piece of her face for an entry in Skull Challenge- Dia de los Muertos for Quilting Arts magazine that is due in May. I sent her a picture of it and she said it was "Awesome." My oldest does not dole out praise abundantly so I take it when I can get it. I am currently working on a similar piece depicting my youngest daughter. It still has a ways to go but it looks like her. This month brings the start of a new series and I'm very excited about it. Friends, lovers, teachers, family and strangers beware. You never know whose face is going to appear up on the wall. I will try to be flattering in my attempts but sometimes you get what you get. I will revisit my "living the good life" series in the future but I feel like its time to move on to bigger and better things. I believe that that brings everyone up to speed on my current quilting endeavors. When I feel like I don't know where I'm going or how to get there I watch Neil Gaiman's inspirational commencement speech at UARTS from 2012. Since I spent lots of hard earned money at this school (my oldest child's alma mater) I'm glad to get something from it personally. Maybe you can get some inspiration from it also. So, keep on quilting and make good art. See you next month.